Cut the meat into 2 cm cubes. Arrange on a serving dish. 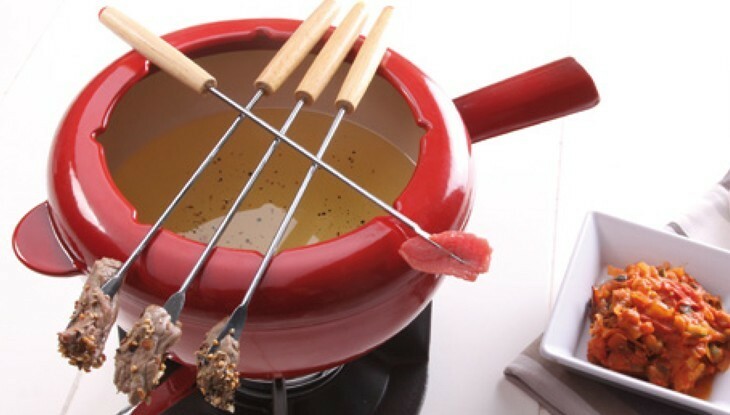 Heat the oil in a fondue pot on a high heat. When the oil is hot (check the temperature by dipping in a bread crust, the oil must sizzle), serve and keep it warm on the burner base. Each guest cooks their own pieces of meat by dipping them in the hot oil and seasoning them with the different sauces such as mayonnaise, Ketchup, yogurt sauce, herb sauce, Roquefort sauce, etc. You can also serve potato chips, fries, oven potatoes, a range of salads, raw vegetables or gratinated vegetables with your Fondue.